In the work we have been doing, which we have called Footprints of Emergence, we have identified 25 factors which we think can be described and discussed in relation to the balance between prescribed and emergent learning. We have arranged these factors into four clusters, one of which is Presence and Writing. This was the last cluster we added in developing this work and it remains the most difficult to articulate clearly. Clusters and Factors (from Footprints of Emergence). Click on the image to enlarge. This past week I have been thinking a lot about what we mean by ‘Presence’. It has been very significant in online teaching and learning for a number of years and I am now finding, through the ModPo MOOC, that it is even more significant in poetry and writing than I had imagined. Garrison, D. R., Anderson, T., & Archer, W. (2000). Critical inquiry in a text-based environment: Computer conferencing in higher education. The Internet and Higher Education, 2(2-3), 87-105. In the paper they discuss the categories and indicators of social, cognitive and teaching presence, which they consider to be the essential elements of a community of inquiry. This suggests that if we want a deep and meaningful learning experience in any learning environment (ModPo could be an example), each participant needs to develop a social, cognitive and teaching presence. In the ModPo video discussion of Walt Whitman’s Poem – Song of Myself – the question of what presence means in writing and language was also briefly discussed. Here, unlike Anderson et al., who seem to assume that there is something we call presence that we need to develop, the discussion was more about ‘what is presence?’ The explanation from the video discussion that aligns with my own thinking was ….. The words of the poem, the language, is the experience. The writer is gone, but the presence of the writer remains. This fits with a definition that presence is ‘A person or thing that exists or is present in a place but is not seen’. The person is not there but is there. And it is easy from this to see how writing can enable this development of presence. But, what has become clear to me from reading Emily Dickinson and Walt Whitman’s poems is that presence is not only in the hands of the presenter, the poet, author, writer, but also in the hands of the reader, receiver, listener, audience. For me Emily Dickinson is much more present than Walt Whitman. I feel I can empathise with her. Her words resonate with my thoughts. I have written about the riddle of resonance in learning before, with my colleague Matthias Melcher. does it incorporate space for quiet reflection? S + Cont Too much inter/activity < … > Personal space for exploring, reflecting on and developing ideas, aspirations and values. in networks, in & beyond the course or event? Net Formalised, inflexible groups < … > Initiating, creating, engaging with new contacts and groups. It is interesting to think that Emily Dickinson (and perhaps even Walt Whitman) didn’t need networks, lots of interaction and different modes of engagement to establish a presence, but I suspect she did need solitude and contemplation and space for this. Ironically, for a lot of people MOOCs might be the last place you would go for solitude and contemplation. Perhaps this is one of the reasons why it is so difficult to establish a presence in MOOCs, but why I can feel Emily Dickinson’s presence so strongly in her poems. Here is the third and final instalment of our paper on e-resonance. You can find the PDF of the full article here – The Riddle of Online Resonance. Two prior instalments have been posted here and here. We decided to post in three instalments to make reading of the paper online easier and to allow time for reflection and comment, which we welcome, either here in this blog, on Matthias’ blog or elsewhere. Many thanks to those who have already commented. The authors suggest that there are various factors which affect e-resonance. Consideration of these is important if we are to support and enhance possibilities for e-resonance in online teaching and learning. These factors include the place and location on the communicator’s cognitive and network maps, the interplay between personal and conceptual resonance, the lack of visual and auditory cues and the increased possibility for creating weak ties within an online environment. The number of connections that people have and how well connected they are will obviously influence the potential for e-resonance. Lilia Efimova (2009) has suggested that frequency of communication, the use of multi-channels of communication, affinity, commitment and attention are all required for establishing and maintaining online communication. The authors’ experience suggests that multi-channels of communication may not be needed for e-resonance but that at least one second channel is necessary for affinity, commitment and attention. This can be as simple as appreciating the banner on a person’s blog to discovering an unexpected shared interest. In If a person ‘A’ notices that ‘this thought B4’ of person ‘B’ resonates with me, then there is a selection being made from among say, nine thoughts B1-B9. And when ‘A’ elaborates the similarity of her thinking (or at least puts the resonance into some context), she thereby identifies an idea, say ‘A6’ from her ideas A1-A9 depending on her view of A5-A7 and suggests some connections from concept ‘A6’ to ‘B4’ (not simply from person A to person B). In turn B learns about the selection of A6 from among the A1-A9 that he might already know or discover on A’s site. This process of selection of a resonating idea, whilst most likely to be unconscious and uncontrolled, is supported by the lack of auditory and visual cues within an online environment, which allows for conceptual connections to be more prominent and less influenced by personal and physical attractiveness, appearance, charisma and personality. Finally, not only the number, but also the nature of connections within the online environment will affect e-resonance. Much has been written about weak, strong and latent ties and the strength of weak ties, which Haythornthwaite (2002, p. 387) describes as being in …’ their connection to others outside the strong tie network and to the information and to the information and resources circulating in other areas’. This view of the strength of weak ties is supported by Schulmeister (2009) who writes that a discourse analysis of small networks, consisting of strong ties, has shown that they are so emotionally charged that rational discourse rarely occurs. Other authors such as Downes (2006b) and McCrae (2006) have also written of the dangers of group think and echo chambers in constraining free flow of ideas and creativity. From this it would appear that ties can be at their most valuable when they are at their weakest and just beginning to form, that is, when initial resonance occurs. The authors present this paper for discussion. Whilst much has been written about fostering and developing online communication, little, if anything, has been written about how online connections are made in the very first instance. The authors have suggested that this be termed ‘e-resonance’ and have attempted to describe the mechanism of what happens when an idea or some micro-content strikes a chord or resonates with someone else, and when that other person’s reaction, in turn, influences the first person’s conceptual network. In seeking the answer to this question we have come to some conclusions which we believe to be significant for teaching, learning and communicating within online environments. First is that resonance happens indirectly rather than directly, just as children’s learning of words happens by indirect rather than direct effects (Landauer & Dumais, 2010). E-resonance is unconscious, uncontrolled and is most likely to occur in the ‘messy’, ‘vague’ communications between very weak ties. Second, there are skills that online learners rely on to support the likelihood of e-resonance occurring. These involve being able to filter and select from a wide range of information, even within one post, if resonance is to occur. The parts of a text that do resonate with someone else are a very significant selection of the entire text because this selection does not necessarily indicate just some validity measure, but a conceptual connection within someone else’s cognitive network. Third, online connectivity is as much about interconceptual connection as interpersonal connectivity. The potential for conceptual connectivity is increased in contexts where e-resonance can flourish, because e-resonance occurs at the level of ‘meeting of minds’ free from the distractions of physical and visual cues. It occurs at a ‘beyond verbal’ level. Finally, e-resonance is not about ‘sameness’ but about similarity, which can also support dissimilarity. It is likely to be constrained by strong ties, group think and echo chambers. The authors therefore suggest that further consideration of e-resonance and how initial connections are made between online learners will be important in furthering our understanding of online connectivity. The riddle of online resonance remains unsolved. Haythornthwaite, C. (2002) Strong, weak and latent ties and the impact of new media, 18, 385-401. The information Society. McRae, P. (2006). Echoing Voices – Emerging Challenges for Educational Practice on the Internet. In: Reeves, T. & Yamashita, S. (Eds. ), Proceedings of World Conference on E-Learning in Corporate, Government, Healthcare, and Higher Education 2006 (pp. 2622-2629). Chesapeake, VA: AACE. The Riddle of Online Resonance by Matthias Melcher and Jenny Mackness is licensed under a Creative Commons Attribution-NonCommercial-NoDerivs 3.0 Unported License. This discussion paper explores the nature of online connectivity and, in particular, seeks to better understand how online connections are made in the very first instance of contact. There has been plenty of research on how to develop online connections once they have been made, but the question of how the initial contact is made has not received much attention. What is it that enables a potentially beneficial connection to be made with a previously unknown online communicator? We propose that the answer lies in online resonance, which we have called ‘e-resonance’. In this paper we consider what the characteristics, affordances and affecting factors of e-resonance might be. What sparks it off? This might not be the content of the post, but rather a secondary topic such as a mutually shared interest. What are the key indicators of e-resonance? Are there any specific skills associated with e-resonance? In response to these questions we discuss the possibility of ‘beyond verbal’ communication and the importance of being able to filter and select information on personal and conceptual levels. We also consider what e-resonance might mean for the author and reader of online messages in terms of stimulating new thinking. E-resonance is a riddle which is relevant to connectivity and knowledge creation in the online environment. However, we conclude that the riddle of online resonance remains, as yet, unsolved. This paper/blog has arisen from the mutual interest of the two authors in online connectivity. George Siemens, in the 2008 Connectivism and Connective Knowledge Massive Open Online Course (CCK08 – which both authors attended) has written about the primacy of connection for learning. Learning through connectivity is not a new idea; there is a long history of research into networked learning (Steeple & Jones, 2002; Goodyear et al., 2004) and social learning in communities of practice (Wenger, 1998), but the affordances offered by Web 2.0 technologies and networked online learning for autonomous learning in an increasingly diverse environment (Downes, 2009) have led to many authors (Krebs (2002), Haythornthwaite (2002), Granovetter (1973, 1983), to name but a few) exploring how connections are made and developed in online environments. However, much of this existing research focuses on understanding connections once they have been made, for example on how to increase connections and exploit the diversity that the web offers (Downes, 2007, 2010), or the types of connections that are made (Haythornthwaite, 2002). There is little research that we can find which explores ‘how’ connections are made in the very first instance of contact. What is it in an online environment that causes/enables one person to recognise another, in that first instance of ‘meeting’, as a potential learning partner, colleague or friend and to make the connection? Trying to understand this question seems to be increasingly important in a world where learners can easily find themselves in complex open education systems. The freedom these systems afford can lead to messy, chaotic learning environments, which are a far cry from the tidy, goal-directed, message-transfer that is common to traditional learning systems. Learners can easily feel lost, unsupported and unable to find their way in the environment or make appropriate connections (Darken & Sibert,1996; Mackness et al. 2010). A better understanding of how initial connections are made online is needed by both teachers and learners. We suggest that this might be possible if we consider more closely an intriguing, novel, promising phenomenon that is increasingly encountered in online work and which we want to call ‘online resonance’, or ‘e-resonance’ for short. What do we mean by e-resonance? When an idea or other element of an online artefact by an online author (A) ‘resonates with’ an online reader (R), and R comments or responds, or at least will subsequently watch more attentively for more work of A, then resonance occurs. This resonance initially occurs on a social (person to person) level, but we will later see (in section 4) that e-resonance also involves the conceptual level and, furthermore, links the two levels in a very singular way. Outside the online world, patterns of interpersonal exchanges have long been described by acoustic metaphors such as “it resonates with me” or “it strikes a chord” or “we are on the same wavelength“. When encountered in online exchanges, however, these metaphors assume an entirely new frame of reference. What is novel and unique about this is not only the range of promising, powerful affordances of resonance in the online environment (see section 5) such as facilitation of learning connections, stimulation of unexpected ideas and filtering out of essential aspects, to name a few, but also the complex, baffling process of igniting the resonance effect, which can hardly be predicted but can be clearly identified when it has happened. While it is possible to identify some criteria for determining when it might happen (see section 4), for describing some factors that are associated with it (see section 6), and for approximately describing the mechanics of how it works (see section 3), the exact reasons for why it happens, are even more difficult to pin down and might remain a riddle for quite some time in the future. In writing this paper we have not attempted to solve this riddle, but rather to explore its unique characteristics, with a view to increasing our understanding of online communication and how this might differ from face-to-face (F2F) communication. Much has already been written about the differences between online and F2F communication ( see for example Jonassen & Kwon, 2001; Conole et al. 2006; Creanor et al. 2006; Sharpe et al. 2005), but considering them from the perspective of e-resonance provides an additional/alternative perspective. A core difference between online and offline communication is that offline we are immersed in a common environment which forces people at both ends of the communication channel into a binding protocol of understanding, asking back, or contradicting. Online, we are asynchronously situated at our own ends of the communication channel, having the freedom to pick distinct aspects to mentally engage with, interpret them individually and independently of others and then decide whether to react (arguing or affirming) or just skip them. Another difference is that offline any minor misunderstandings in the conversation can be quickly resolved through questioning or reacting. Conversely, major misunderstandings or talking past each other might go unnoticed or be ignored, leaving the illusion of successful communication, which can often be the primary goal. In contrast, online we have more freedom to disregard and ignore elements of communication and engage only with resonating elements. As a result this online communication may be more thorough and reflective, whilst at the same time always offering the potential for replying, but not forcing this. Perhaps the most significant difference between F2F and online communication is that the online environment offers a unique combination of the affordances of slower literal reflections and faster oral/F2F reactions. While literality, as commonly experienced through reading books, typically offers more opportunities for reflection than orality, it has the shortcoming that reactions are slow or hardly possible, especially in the offline paper world. The technologically enabled online environment, by contrast, simultaneously allows for both quick reactivity and asynchronous slower reflection. F2F communication therefore tends to aim for agreement through accommodation, tolerance and avoiding confrontation by talking past each other, even in cases of intellectual debate where communicators will agree to disagree. Asynchronous online communication, on the other hand, allows for more reflection and choice and the ‘potential’ to respond is more in the communicator’s control. So trust, empathy, closeness and friendship, all of which affect learning and communication arise differently in the two environments (on and offline). For this paper we consider resonance best explored in terms of one-one connections, as described in section 1 for author A and reader R, rather than one to many or many to one connections, which are often considered when investigating how online communication occurs. Reflection on how any online connection is initiated, what might spark e-resonance, leads immediately to the realisation that e-resonance is related to common thinking patterns and interests. It does not appear to be related to the age of communicators, although their cultural backgrounds may be influential. These aspects are not surprising. Perhaps more surprising is that e-resonance does not necessarily involve reciprocity and should not be confused with recognition. It does not require a response to be made for it to occur; it precedes this stage of communication. Neither does it involve acknowledgement, nor the identification of something as having been previously seen, heard or known. All this would imply that e-resonance is under our control, whereas we believe that it relates to ‘out of control’ unconscious communication. This being ‘out of control’ is in line with the complexity of online communication, where learning and connectivity are necessarily unpredictable, surprising and emergent (Snowden, 2007; Morrison, K. 2008). (See section 4 for further discussion of unconscious communication in e-resonance). Whilst resonance is related to common thinking patterns and interests, this does not mean that it is related to ‘same’ thinking patterns and interests. Resonance is not about ‘sameness’. Rather it is about one or more ‘similarities’, which may be nonverbal or ‘beyond verbal’ (see section 4). To find like-minded people who just share the same interest we could simply search for a suitable forum or other site. E-resonance is more than this. The idea that resonance is about similarity rather than sameness is supported by the work of Etienne Wenger who writes that, ‘When we engage in a conversation, we somehow recognise in each other something of ourselves, which we address’ (Wenger, 1998, p.56). Wenger is also clear that communication in a community of practice is not always harmonious. What we recognise has to do with our mutual ability to negotiate meaning. This mutuality does not, however, entail equality or respect (p.56). Likewise, the notion that e-resonance is about similarity, does not mean that it is always positive and harmonious. It can equally be disharmonious or negative. Imagine a world consisting of 995 rectangles and 5 parallelograms. We have ignored the parallelograms because our teachers have focussed on the tidy rectangles. Replacing rectangles with “successful message transfer communication” and parallelograms with “out-of-control communication with the chance of inspiring resonance”, provides a picture for explaining the relationship between out of control communication and e-resonance. E-resonance will therefore mean different things to different people and will be experienced differently according to the context. At initiation e-resonance might involve unspoken/ beyond-verbal sameness or similarities, about common ground and similar thoughts, but the verbal messages of the exchange itself might lead to difference and dissimilarity if this helps cross-pollination and stimulation of ideas. This mixture of intertwined verbal/ nonverbal and personal/ conceptual ingredients all adds to the riddle of online resonance. Conole, G., deLaat, M., Dillon, T. & Darby, J. (2006). An in-depth case study of students’ experiences of e-learning – how is learning changing? Proceedings of the 23rd annual ascilite conference: Who’s learning? Whose technology? Creanor, L., Trinder, K., Gowan, G. & Howells, C. (2006) LEX: the learner experience of e-learning final project report, August 2006. Report under the JISC e-pedagogy understanding my learner programme. Glasgow: Glasgow Caledonian University. Darken, R.P. & Sibert, J.L. (1996). Navigating Large Virtual Spaces. Int. J. of Human-Computer Interaction, 8 (1), 49-72. Goodyear , P., Jones, C., Hodgson, v., Asensio, M. & Steeples, C. (2004) Undergraduate students’ experiences of networked learning in UK higher education: a survey-based study. Advances in research on networked learning. (Goodyear, P. ed.) Dordrecht : Kluwer Academic Publishers. Jonassen, D.H. & Kwon, H. (2001) Communication patterns in computer mediated versus face-to-face group problem solving. Vol.49, No. 1, p.35-51. Educational Technology, research and development. Morrison, K. (2008). Educational Philosophy and the Challenge of Complexity Theory, 40(1), Philosophy. 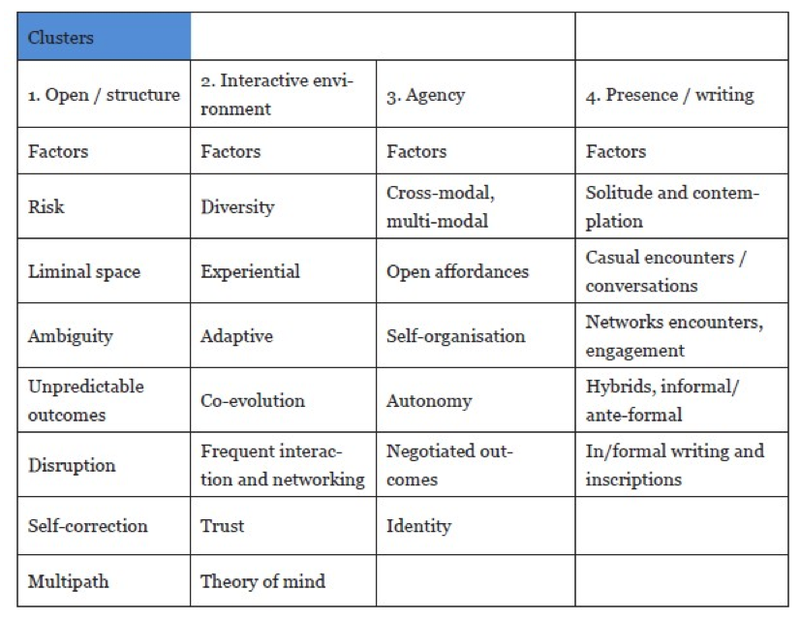 Steeple, C. & Jones, C. (2002) Networked Learning: perspectives and issues. London, Springer. Wenger, E. (1998) Communities of Practice. Learning, meaning and identity. Cambridge: Cambridge University Press. The subject of this blog post is the result of a discussion that I have been having with Matthias Melcher – and he with me 🙂 – since the beginning of the year. Matthias and I ‘met’ on the Connectivism and Connective Knowledge Course (CCK08) – and through this discovered that we are both interested in how online connections are made and we have been discussing this off and on ever since. As a result of these discussions we have now written a discussion paper that we would like to share in the spirit of openness that we learned about on the CCK08 course. This discussion paper explores the nature of online connectivity and, in particular, seeks to better understand how online connections are made in the very first instance of contact. There has been plenty of research on how to develop online connections once they have been made, but the question of how the initial contact is made has not received much attention. What is it that enables a potentially beneficial connection to be made with a previously unknown online communicator? We propose that the answer lies in online resonance, which we have called ‘e-resonance’. In this paper we consider what the characteristics, affordances and affecting factors of e-resonance might be. What sparks it off? What are the key indicators of e-resonance? In response to these questions we discuss the possibility of ‘beyond verbal’ communication and what this might mean for the author and reader of online messages and whether particular skills are needed to be able to benefit from e-resonance. There is no doubt that e-resonance is a riddle, which remains, as yet, unsolved. Our intention is to post our paper in three instalments and we would very much welcome comment, positive or negative, and discussion about the ideas that we have incorporated in the paper. We will also be posting a full PDF of the paper at some stage. Connected Resonance – what does it mean? I have just watched a TV programme which has moved me to make this post after quite a long absence from blogging. The programme (on BBC 2 – UK – with the title Classic Goldie) was the story of a DJ who cannot read music, who composes an orchestral piece for the BBC proms, accompanied by the 70 str0ng London Philharmonic Choir. This one hour programme has prompted me to blog again after quite a long gap. Why? The programme moved me in a number of ways. I could relate to it, perhaps because my second son is a music technologist – full of dreams like Goldie – but yet to realise his potential. I didn’t record the programme and now wonder whether I will be able to find it again to show my son who is about to start on a music technology degree. I could relate to Goldie’s emotion when he saw his work, efforts and dreams being translated into practice. There was resonance in the immense feelings of self-doubt, concerns about self-worth and levels of expertise, expressed by Goldie. There was also resonance in the power of music. I could understand that the power of music lies in melody, but I also remembered the book I read in my ‘youth’ about Stockhausen and the effect that that had on me in relation to my understanding of creativity. All this makes me wonder again what it is that causes a connection. It is not technology. In this instance it was my past experience, my prior knowledge of the subject ( albeit limited, although I do sing in a choir which explains my interest), a close family connection – my son who I love -, my empathy with Goldie as a novice working with experts and the emotion he experienced, and finally my conversations with my colleague and online friend Matthias, who first raised for me the question of how and why we recognise resonance in online connections. From this I might now think that online connections/renonance are related to past experience, current emotions, levels of interest and expertise, empathy, mutual interests and mutual respect. PS Twitter would just not do what I need for this post! This idea – raised in our research team – has grabbed my attention. Why is it that when communicating online we are immediately drawn to certain people’s posts/blogs and not to others? We resonate with certain people and ideas and not with others, just as I was immediately attracted to the idea of resonance in online communication. I have spent a little time checking on my understanding of resonance and these are some of the explanations that for me relate to blogging as a means of online communication. Resonance is the amplifaction of sound through sympathetic vibrations. To resonate means to correspond closely or harmoniously. Resonance occurs when the vibrations of one object come into alignment with another. Resonance evokes a feeling of shared emotion or belief. These explanations make sense to me in relation to blogging. I can recognise them in my own blogging behaviour. I am drawn to blogs where these ideas come into play. The content of a blog post on its own is not enough to draw me in. I might be attracted by the idea/s but I will soon lose interest if there are no feelings of resonance. But I have no idea why one blog will set off this resonance and another won’t and I don’t think I explicitly recognise this resonance when it is happening – it is more intuitive – a ‘gut’ feeling. Still thinking…..